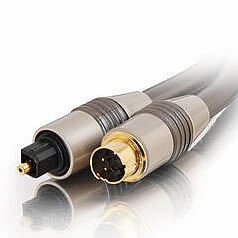 Velocity LT™ S-Video/TOSLINK combination cables offer high quality digital sound and video for today’s audio and home theater applications. These cost-effective high-performance cables ensure accuracy and fidelity. Velocity LT™ S-Video/TOSLINK cables are manufactured with high-quality optical fiber with a polished lens and gold-plated collar. The 24K gold plated S-Video connectors ensure a lifetime of performance. The stylish PVC jacket adds flexibility and durability for years of listening pleasure. For the ultimate experience, connect from your advanced performance gaming system to a quality home theater and large-screen display!